Geopathic Stress is something most people - and even some medics - have never heard of, or do not understand (in detail). When you (unknowingly) suffer from Geopathic Stress, this would mean that you have already been exposed to Geopathic Zones for some time and could have a real and severe Health Problem, and not just a mental condition. At times patients 'claim' to be sick, but nothing 'can be found' in the hospitals or clinics, so if the medics cannot find anything wrong any more1 this should be an alarm sign to check for other solutions to these problem. Even some so called experts are still confusing and interchanging Geopathic Stress (the actual illness) with Geopathic Zones (the actual problem that is causing the illnesses). Geopathic Stress so to say is a collective for a whole array of various possible illnesses you could suffer from. Some of these may be linked and others might not have anything to do with any other illness you also might have. This is why it is often so difficult to find out what is actually going on in the body, if you or your house (bedroom / sleeping place) are not being tested for Geopathic Zones (GZ) and Electro Pollution (EP). Geopathic Stress is already the problem - call it the ILLNESS caused - due to exposure to Geopathic Zones over a prolonged time, which are influencing humans, animals and plants alike. You can see this as the physiological stress caused on all living cells while being exposed to and under the influence of Geopathic Zones and EMFs/EMRs. Even though some people, animals and plants are more sensitive to these conditions and react quicker than others. Even causes of accidents2 and suicides3 are linked to Geopathic Stress and so are many serious and degenerative illnesses. It might start with concentration problems, irritability and sleepless nights, chronic tiredness and ending in depression and even suicide or other serious chronic or degenerative illnesses, like cancer, ME, MS, MND and other. Lightning Strikes in Geopathic Crossings, inclusive Water Veins. Please do not forget your Environmental Health, after all it was Gustav Freiherr von Pohl who found the missing link between cancer and sleeping positions already over 83 years ago, with his startling investigation in Vilsbiburg Germany, between December 1928 and January 1929. The problems caused by Geopathic Zones could impact you on a large scale, starting from a sleepless night, concentration problems - even spontaneously or irritability (even a change of character in extreme chases) getting more severe as the time, you are exposed to that specific GEOPATHIC ZONE, continues. 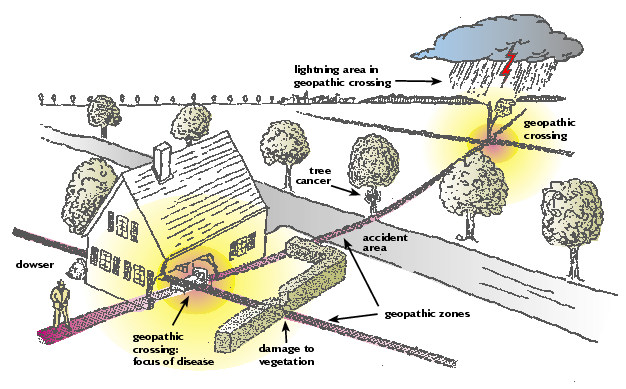 Please note that Geopathic Crossings (CROSSING AREAS of overlaying Geopathic Zones inclusive of EMF/EMR), also called DOUBLE ZONES are even more aggressive towards your health, and are also mostly causing cancer exactly at these double zone. The specific location (place), duration (time) and the intensity (level) of the radiation you are exposed to, working in on your body, play a significant role, as they will be causing the problems in exactly those regions of you body which are being exposed to the Earth's radiation (coming up from within the Earth) as well as EMR/EMF (Electro-Magnetic Radiation/Fields) from your surrounding area. Very often it is exactly those problems which are causing conditions in the patient which are known to be therapy-resistant or treatment-resistant when no impact can be seen by the prescribed medication, therapy or treatments. Cancer, chronic illnesses or allergies are just a few other such problems, as are illnesses which are causing the weakening of the immune system and the degeneration body. As the cells exposed to the radiation are damaged by the radiation the organ or body part in question also degrades on the same rate. Sometimes medication and therapy can however assist and support the body to become better for a while. However, over time these initial effects will be fade again and then the body normally could quickly fall back. Therefore it is very important to have your home and sleeping place investigated for just these problem zones. It is also a fact that over the time you are located at your sleeping place (sleeping in your bed) there is an IMPRINT of the said radiating energies (if present) into your body. Therefore it is very well possible to also conduct radiation testing on your body to get an idea to which radiation problems might be found at your sleeping place. More severe cases always have more than one problem zone affecting the body which means that the effects of various problem zones can also overlap on certain body parts, that is why these will be affected more or differently than others. The radiation in your body and sleeping place can be determined with an accuracy of less than 1 cm. When the investigation shows up problem areas, a predefined method can be chosen to remedy the effects of the radiation on your body, which again is depending on each specific local conditions and the space available. The best and cheapest way would be, to simply move your bed out of the affected area - into an unaffected area, but this is not always possible - especially in newer houses, where the rooms are very small. Sometimes there is not even enough space left to turn the bed by 90°. In this case the only other solution would be, to make use of suitable and carefully researched screening materials to effectively block out this radiation, not to reach your body any longer. Soon thereafter the patient should be getting better, depending on the severity of the current condition and the energy in the body. Thus the recovery time will vary accordingly and can be instant (from the first night), up to about 3 months. If after that time there are still problems, another investigation should be carried out, either looking for changes in the environment - directly around your sleeping place and directly effecting it, as you could have been moving various metal products (magnetic or non-magnetic) around in your home, which may influence the Earth's magnetic fields changing the whole set up in special conditions. The solution to an answer is normally straight forward, but there may also be complicating factors. This write-up is to give guidelines for people seeking help and not to be a complete and detailed instruction or course to do the work themselves. Training courses are available on request. All the above illnesses and problems are directly or indirectly related to the effects caused to the body's cells by Earth Radiation present in the so called Geopathic Zones. 1. Please see the Place-bound and Technical Radiation as Cause for chronic and therapy-resistant Illnesses (A Case Study on 52 patients of a medical doctor), available from us in German, English and soon also in Afrikaans.